A small dog is much simpler to take care of than big dogs for the most part. Small pups are less space consuming, make much smaller poops, and eat less food than large dogs. But having small dogs can present a few unique problems for the owner to solve, like finding a harness for their pint-size pup that is not just small enough, but comfortable, secure, and also safe. The good news is that you need not look any further – we have found 5 of the best harnesses for small dogs that promise not to pinch, choke, or chafe your pooch, giving them the freedom to enjoy walking, playing, and running. Keep reading if you would like to find out which harness is the best for your small dog. This harness is great if you want to keep your pup safe everywhere you go. 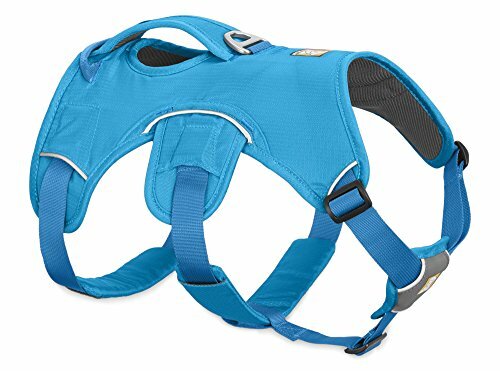 It is a cool, comfortable, pain-free harness that comes in different sizes, perfect for your smaller pooch. This harness is made from comfortable, lightweight, breathable mesh fabric that is extra comfy, no matter the season. The step-in design is easy to use, allowing you to secure your pup in seconds. The harness is durable and strong and has metal D-rings that are sturdy and heavy duty. This is paired with a Velcro closure to ensure your dog stays safe and secure. 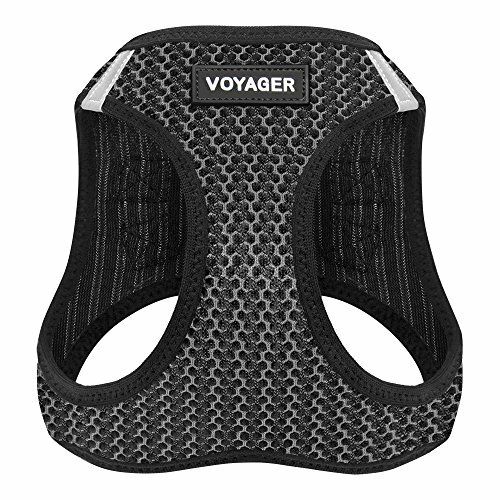 Along with the double D-rings, additional padding, and strong buckle, the Voyager also has reflective strips, making your dog very visible on early morning runs or night walks. This harness is available in four different sizes from extra-small to large, and fifteen beautiful color options, including black, red, blue, and pink. This harness has been designed to keep your pooch safe, secure, and comfortable. You can purchase it in a size small enough for pups with a 7 inch neck and can easily be adjusted to create the perfect fit. It is rare to find a harness that is both affordable and high quality. This harness boasts two metal D-rings that are reinforced. You can quickly attach the leash securely to the harness when needed. The quick-release buckle makes the harness simple to put on and remove. The reflective trim makes your pooch very easy to spot when walking in the dark. This harness is made using a unique fabric called Metric 66, which is padded while also being durable and easy to look after. When you want to clean the harness, just wipe it with a damp cloth, hand or machine wash it. This harness is made to take the strain off your dog’s neck and throat, redirecting it to their chest. The smooth, padded material gives your pup extra breathability and cushioning due to the stretchy, no-chafe fit. This harness is very comfortable and will not rub or irritate your dog’s skin. The mesh material evenly distributes your pup’s weight over their chest. The cozy yet snug fit ensures your dog won’t back out of it. This harness is made from breathable, strong, soft, heavy duty polyester mesh that envelops your pup’s body, keeping them safe and cozy. The harness can withstand jerking, pulling, and tugging with ease without being thick or heavy. There aren’t any protruding catches, clips, or sharp hooks. The chest straps are easy to adjust so you can get a custom fit for your pup. You can adjust both the chest and neck. The snug harness lets your pooch walk, run, and explore safely while remaining securely on the leash. This harness comes in a variety of 12 different color options and has padding to make sure your pup has the most enjoyable experience wearing the harness. This harness comes in different sizes, from a 10 inch to a 30 inch chest size. This harness has a D-ring on the back of the harness. The entire harness is machine washable, so you can keep it clean, hygienic, and smell-free. This harness has been made with your pup’s comfort in mind. It is well-built and stylish, providing your pooch with a high quality product that will not chafe or hurt them. This harness is made for dogs with a chest size of 12.5 to 16.4 inches and a neck circumference of 9.8 inches. 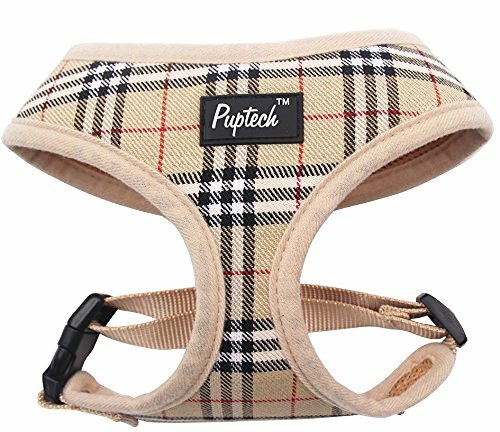 The PUPTECK is made from durable yet soft 100% polyester which is very breathable and comfortable for your pooch. The easy-clip back buckle has been tested to provide extra security while the strap is adjustable for a custom fit. The vest-style design ensures that your pup is comfortable when walking, running, and playing. This harness comes in a variety of different color options, including blue, pink, and purple. 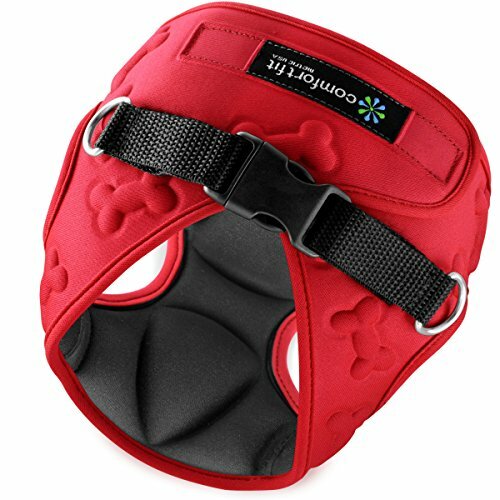 It is also available in five different sizes from XS to XL, so you can find the perfect size and color to suit your pup. 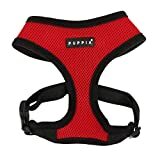 This harness contours to your pup’s body for a comfy, snug fit while the handle and connection points evenly disperse your dog’s weight when walking and being lifted. Getting a harness to securely fit your pup is half the problem, especially when you have a small dog that is also very good at escaping. But this harness ensures your pooch will stay firmly in place thanks to the additional belly strap. There are five different adjustment points that allow you to really get a custom fit for your dog. The straps are all padded to evenly distribute your dog’s weight as well as keep them comfy when out and about. There is a padded handle at the back of the harness which has a web-reinforced, aluminum attachment ring to give you a secure leash attachment point. The stitching is reflective to ensure your pup is as visible as possible. You can easily clean the harness in warm water and it air dries very quickly. You can purchase the harness is five different sizes from XS to XL as well as three colors: red currant, twilight gray, and blue dusk. It is easy to see why it can be challenging to select the correct harness for your beloved pup. There are so many options, each with their own features, pros, and cons. However, we have listed the five best options for owners of small dogs who want their pups to be comfortable, safe, secure, and stylish while also ensuring that they are not pinched, choked, or chafed when walking, running, hiking, or playing. While all of the above options are worthy, our favorite is the RUFFWEAR Web Master Dog Harness thanks to the two ultra-secure attachment points and the handle for balanced, controlled lifting. The reflective trim increases visibility when walking in the early mornings or evenings, and the adjustable, padded straps allow for a customized fit. With all of these features, it is easy to see why this harness is a firm favorite among those who have purchased it.